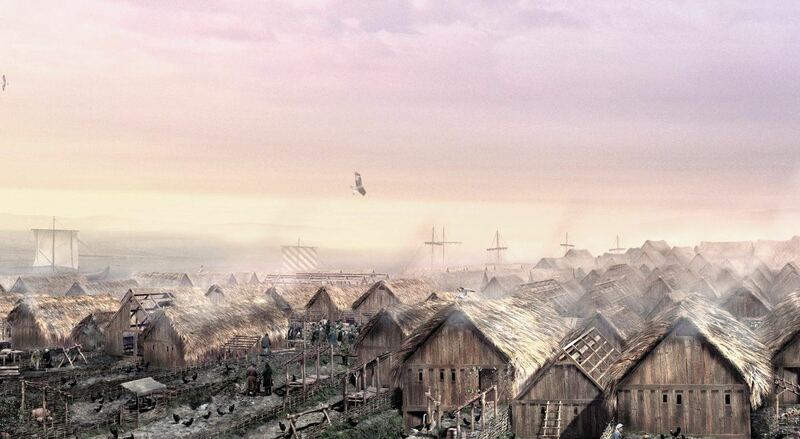 …from the ruins of houses, to precious objects and even skeletons of Viking men and women, but one key piece of evidence that we see all the time is something we might not even realise is of Viking origin: the names of the places we live. “Up the Thames, and then up the Lea, and along the Lea to its source, then in a straight line to Bedford, then up the Ouse to the Watling Street”. Vikings settled all across the country, but the densest population was found in Yorkshire, where they had their capital city, and it is here where we see more Viking place names than anywhere else. We can still see evidence of Viking Age York in the names of streets and places in the modern city. Whereas the ends of names can still suggest that a place has Viking history, with suffixes such as: -thorpe, -by, -thwaite, and -kirk to name a few. A thorpe was an outlying farmstead, one that probably relied on a larger settlement nearby for protection. Thwaite comes from the Norse thveit, meaning a clearing or meadow. By far the most common is -by which means farmstead or village. Like most conquerors, when Vikings moved to a new area they settled into communities alongside the previous inhabitants, then changed the names they found difficult to pronounce. When the Vikings settled in York, they clearly had trouble saying the Saxon name for the city: Eoforwic (which is thought to mean wild boar settlement), so decided to call it Jorvik (thought to mean wild boar creek). Another example is Shelton, which was altered to Skelton, although the -ton on the end would not immediately lead you to think it was a Viking place name. -Ton on the end is usually Old English (the Saxons’ language) meaning an enclosure or farmstead. Sometimes a Viking would have his settlement named after him, but although we don’t have many records of those early Viking settlers, we do know that a great variety of names were in us, as they were used in settlement names. Sometimes nicknames were used, which suggests that they were just as important to Vikings as a given name. Keik means ‘bent backwards’ and is found in Kexby (meaning Keik’s farmstead). Similarly Sleng means ‘idler’, but was also a personal name as well, and can be found in Slingsby, which would mean Sleng’s Settlement (or the idler’s village; Vikings probably wouldn’t enjoy being referred to as ‘idlers’ though). Words describing features and details of the landscape were also common. Langthwaite means ‘long clearing’, Selby means ‘the Village with Willows’, and Ellerton means ‘farmstead near alder trees’. 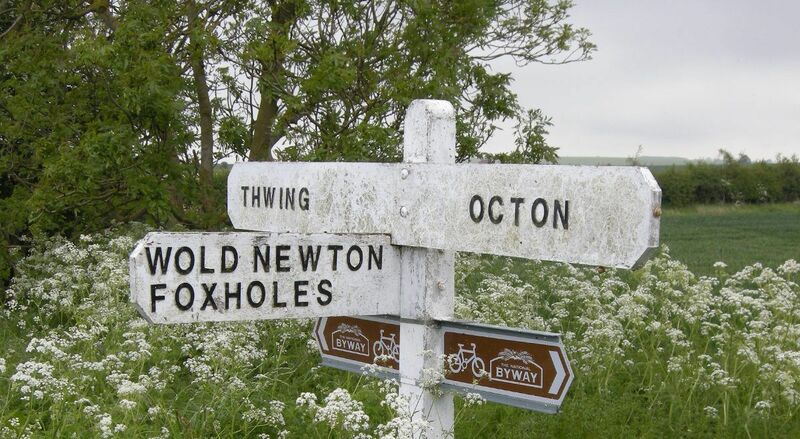 Wold Newton and Octon both have the Old English suffix -ton, meaning 'village', 'estate' or 'farmstead', whereas Thwing may be derived from the Old Norse Thvengr, meaning 'narrow strip of land'. Some of the names found in York are also evidence of its Viking history. Toft was Old Norse for a building plot, found in Toft Green, and Gate comes from the word for street: Gata. It’s important to remember in York: Bar means Gate, and Gate means Street. The street where JORVIK is located, Coppergate, comes from its Viking name, Koppari-Gata. Koppari means cup-maker, Gata means street, so Coppergate translates to: street of the cup-makers. This has been confirmed by the vast amount of wooden objects found in The Coppergate Dig, alongside wood shavings and tools. The word Bootham, the main street leading north west out of York, means ‘at the booths’ or market stalls. The many origins and back-stories to the place names of Yorkshire and beyond show that, despite a thousand years of history, time has not managed to obliterate the Viking’s legacy.